Have you seen the passing planets yet? Today the planets Jupiter and Venus pass within half a degree of each other as seen from Earth. This conjunction, visible all over the world, is quite easy to see — just look to the west shortly after sunset. The brightest objects visible above the horizon will be Venus and Jupiter, with Venus being the brighter of the two. Featured above, the closing planets were captured two nights ago in a sunset sky graced also by high-level noctilucent clouds. 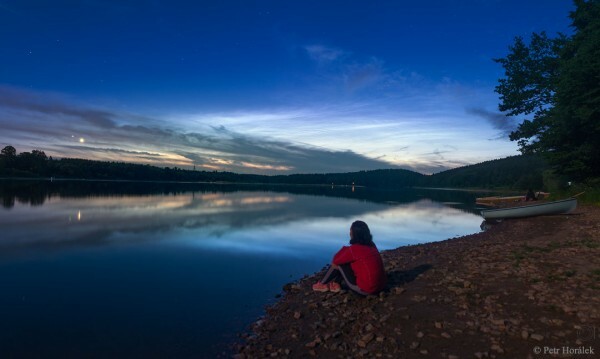 In the foreground, the astrophotographer’s sister takes in the vista from a bank of the Sec Reservoir in the Czech Republic. She reported this as the first time she has seen noctilucent clouds. Jupiter and Venus will appear even closer together tonight and will continue to be visible in the same part of the sky until mid-August.